Last Sunday, my mum had S for me so that I could sort out some important things at home. I spent the whole day upstairs sorting through piles of junk, and just as S was due to come home, I popped onto the laptop to check my emails. As usual, there was a load of junk… but one of the subject headers read “ITV This Morning – nervous breakdown item.” I thought it looked interesting, so I took a look… and it was an email from someone on the news desk at This Morning. After Cheryl Fernandez-Versini had been in the papers over the weekend, they wanted to do a piece in the studio about nervous breakdowns the following morning. They’d seen my blog and wondered if I would like to come into the studio. Often when you get emails like this, they’ve sent a similar request to as many people as they can find – and if you don’t respond quickly, you find that they’ve already got what they needed. I called any way, on the off-chance and found that they did still need someone! We had a discussion about how far I lived from London, and they offered to get me a hotel for the night, but I said no because I’d not seen S all day and didn’t want to then leave her overnight and have my sister take care of her – not fair on either of them. Towards the end of the conversation, S arrived home with my sister and there was an awkward couple of minutes where I was trying to make my sister understand why I was being so rude as to chat on the phone when she’d just returned my daughter to me… then I put the phone down and said “er, I’m going on telly in the morning.” This was the shocking moment where I realised my 19 year old sister had little clue as to who Philip Schofield is. I feel I have failed as an older sister. Any way, on with the story. I begged my sister to stay at our house over night, and to take S to nursery in the morning so that I could go to London. A little later an email arrived with my travel details, and I had a call from Patrick, the assistant producer. I told him my story, and we spoke about the things I would and wouldn’t say on air. I had been running around all day and was standing in my living room in a t shirt and jeans, and began shivering as I talked. To be fair, I’m not sure if the shivering was to do with the temperature, or the fact I often get a bit shaky when I talk about the ins and outs of my life. As I put the phone down, I thought, “oh cripes, what if I make a complete shaky idiot of myself in front of The Schofe and Amanda Holden… and their millions of viewers?” I decided it was best not to think about such things, and quickly set to texting all of my friends to tell them they’d better skive off work in the morning. Monday morning, I left the house at 6:30 in the pouring rain to get a taxi to the train station, where I was hideously early for the 7:15 train to Waterloo. Once I got to Waterloo, there was a car waiting to drive me a distance that would have been quicker to walk even if it weren’t rush hour traffic – but I am rubbish at London, and was grateful for the nice shiny car. We pulled up to the Southbank studios, and a lovely security guard took my name before giving me directions through a loading bay full of props, to a lift. He said to go up to the first floor, and someone would meet me. When I got to the first floor, there was nobody there and I panicked a bit. Someone directed me to the green room, where I met Fleur. Fleur was wearing a bright red dress, shiny shoes and a statement necklace; she looked very intimidating until she smiled and started to speak. Fleur is in charge of the green room, and basically the mum of the show. A couple of minutes later, Patrick arrived and took me into a dressing room where he told me he was very sorry, but there had been a change of plan and they weren’t running the piece – but I was welcome to stay at the studios all morning, they would get me breakfast and I could meet all the stars. I was gutted, but I felt bad for Patrick who must have to do things like this quite often and it wasn’t his fault – the decision had come from elsewhere, as these things often do. I went back to the green room and a nice young man got me a coffee, which I sat sipping as I set about texting my friends to tell them that actually, they may as well go to work after all. A few minutes later, Patrick was back and beckoning me frantically. I followed him back to the dressing room, where he told me there had been another change of plan and we were back on, and I needed to go to make-up immediately. I sat in make up with a gown over my clothes as a lovely lady called Kate worked some magic on my face and hair. As I sat there, looking around the room via the mirror, a familiar face appeared in the door way. Normally, when you see a familiar face it’s someone from work, someone you went to school with, someone you see every morning on the checkout at Tesco. It took me a couple of seconds to recognise that this one belonged to Amanda Holden! She was carrying a tray of cup cakes, each with a photo of Philip Schofield’s face – to celebrate her third week standing in for Holly Willoughby. After she left, all of the make up ladies commented on how lovely she was, and how nice it was to have her there. Next, Martin Lewis came in to have his make up done – and to provide advice on claiming child care vouchers if you only work part time at a job. Bless him, every time I saw him he was answering one question or another! When my hair was almost finished, another of those familiar faces appeared behind me; a kind face, smiling almost apologetically to everyone. She seemed really familiar, in a sort of nostalgic, friendly way. Kind of like an aunt or your first teacher. Then the make up lady said “Oh, I did your make up once, years ago – on Only Fools and Horses!” It was Tessa Peake-Jones. Out of everyone I met that day, this was the one person by whom I was so completely star-struck, I couldn’t even speak. And she was so lovely and normal, chatting away to people! Once my hair and make up were sorted, it was time for someone to put a microphone on me, and I was taken into the studio – which is a lot smaller than it looks on TV. Philip and Amanda were sitting on that sofa, practising their lines on the auto-cue. Off to one side, Gino D’acampo was setting up his cooking bit, and on the other side, Martin Lewis was sitting at a table waiting to ad-lib the introduction to his money section. It was very surreal, to be standing there watching all of this going on… but even more so when the show actually went live. Philip and Amanda did their bit to camera, and then while one of the pre-recorded bits went out, I was sat down on the sofa opposite them. Both gave me a kiss and a hug, and were so friendly it was easy to forget they were massive TV stars on the country’s biggest daytime TV show. I know that sounds hard to believe, but really I think the only way I was likely to get through this was to just sort of ignore the cameras, the lights, the fact I was talking to two very famous people as potentially millions of people watched. The piece I took part in was supposed to be a joint discussion with Dr Dawn Harper, but she had been delayed in the Monday morning traffic, so what was meant to be a brief couple of minutes ended up being a seven-minute segment about my breakdown! It wasn’t as terrifying as I expected it to be though, and as long as I kept my eyes off of the monitor just beside Philip, I think I was ok. When the piece finished, the cameras started to move off to place the next shot. Philip and Amanda both told me well done, and then Martin Lewis, on his way to do his piece, tapped me on the shoulder and told me “well done, that was really inspirational.” As I waited among the cameras and crew to be taken back to the green room, the floor manager came up and told me I’d done really well, and the make up lady told me I’d made her want to climb a mountain. It was all a bit overwhelming to be honest! I’m glad my piece was the first part of the show, because it meant I could go back to the green room and enjoy the atmosphere without having to be nervous. 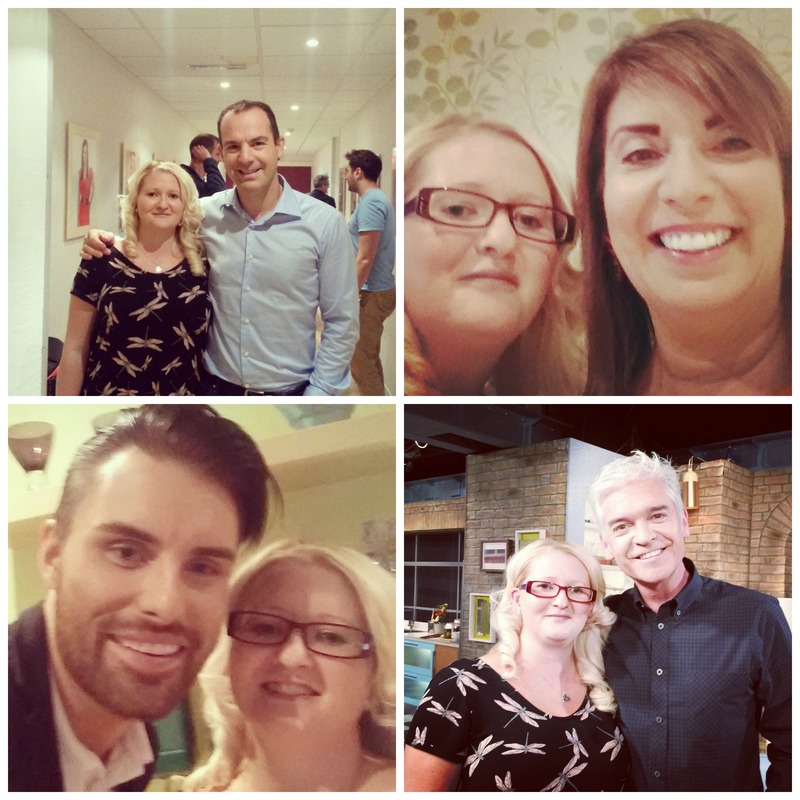 There was a man from X Factor there, who I didn’t know because I don’t watch it; but I think he was in it a few years ago and didn’t get through, and knows Rylan from then. I met Jo Hemmings, who I knew from Twitter and it was lovely to put a face to the name. She was lovely to chat to and really friendly. Fleur made sure I was ok, with another drink and instruction to help myself to any of the food or hot drinks I wanted. She also said she’d make sure I got my photo taken with all of the stars if I liked. With that, Martin Lewis came back from the studio and as he was leaving Fleur took our photo. We had a lovely chat about mental health issues, and how they can affect anyone, but nobody ever talks about it, and then he was off. The Slo Mo Guys were also there, in and out of the green room. I have to admit, I vaguely recognised them but didn’t know who they were until my sister texted me, promising all sorts of favours if I got their autographs for her. I didn’t manage it though – they were busy packing up their stuff after their bit. Liz Hurley was also on the show that morning, but she had a separate dressing room with her own people and security, and none of us saw her – not that I was particularly bothered. Some of the people that came with her were a bit sniffy as well, which was disappointing. As the show went on, people who had been guests left after their pieces and the green room grew quieter. Fleur showed me her collection of Polaroid photos she’d been taking of the celebrities who had been on the show lately. Each person has a photo taken and signs it, and they are auctioned off for Text Santa at Christmas. She did name a couple of people who had refused to take part too, which just seemed like a weird thing to refuse. Gino D’acampo came and sat with us for a little while, and we all wondered aloud why anyone would refuse to have their photo taken for charity. When the show finished, Fleur took me back to the set to have my photo taken with Philip and Amanda – but as soon as they finished the pre-records for the following morning, Amanda had to run off – she did literally run off the set (in ridiculous heels), possibly because it was the Pride of Britain Awards that evening and she had to get ready. I did manage to get a photo with Philip though, which is definitely a tick on the old bucket list! I grew up watching him and Gordon the Gopher in the broom cupboard, and he really is that friendly in person. There was a car waiting for me downstairs when we left, but I had arranged to meet up with a friend so Fleur sent the car away… I felt a bit ungrateful! I had been unable to get online the whole time I was at the studio – my mobile is rubbish, and for some reason I couldn’t get into the wifi. As soon as I got to the train at Waterloo though, I took my phone out – and it had gone bonkers! So many Facebook notifications on both my personal and blog pages, and Twitter had gone a bit mad too. I had a lot of texts from friends and family saying I’d done really well too, which was lovely – and a couple made me a little teary eyed! Monday evening was spent going through endless Facebook notifications; literally, every time I went to Facebook I had about 15 notifications to go through. 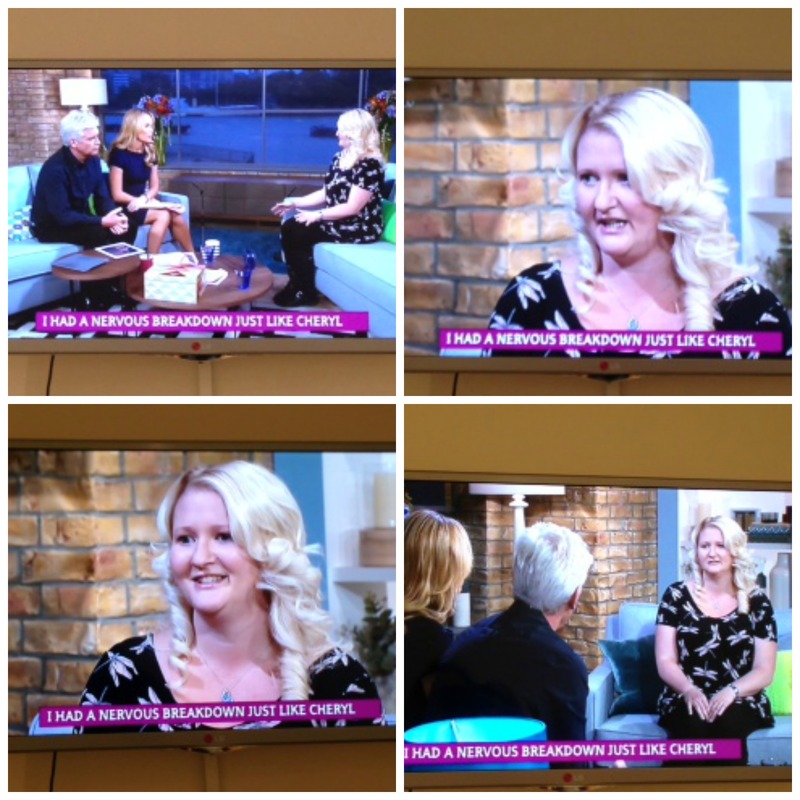 People have been so lovely and supportive, saying well done and that they’re proud of me that I went on national TV to speak about something about which people normally stay very quiet. As I’ve written in a previous post though, my discomfort about being on TV is more about people recognising me, than the subject matter. I find it a bit alarming that so many people watched it! I think in my head, when I agreed to do it I thought other people would see it; people who don’t live around here, don’t know me, but might start to read my blog because of it… that backfired though, when I completely forgot to mention the blog during the interview! Dur! Still, it was a bit of a shock to walk into nursery to collect S that afternoon and have one of the members of staff singing the This Morning theme tune to me! Fab! Well done, you! I’d have been terrified doing this at such short notice with all the last-minute changes. Schofield’s come a long way since the broom cupboard, hasn’t he?